Bear Live Fish Fry Shop info about the game-Games2Rule. Bear finds a new profession, Fisher!! 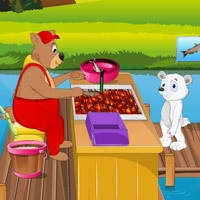 Fishing, Grilling and Selling are the vital activities have to be done in Bear�s new profession. Assist Bear to be successful in his new profession. Attain the every level goal in stipulated period of time to get into higher levels.